Men’s basketball made history on February 28 with its 12th Patriot League victory of the year after defeating Lehigh 61-55. 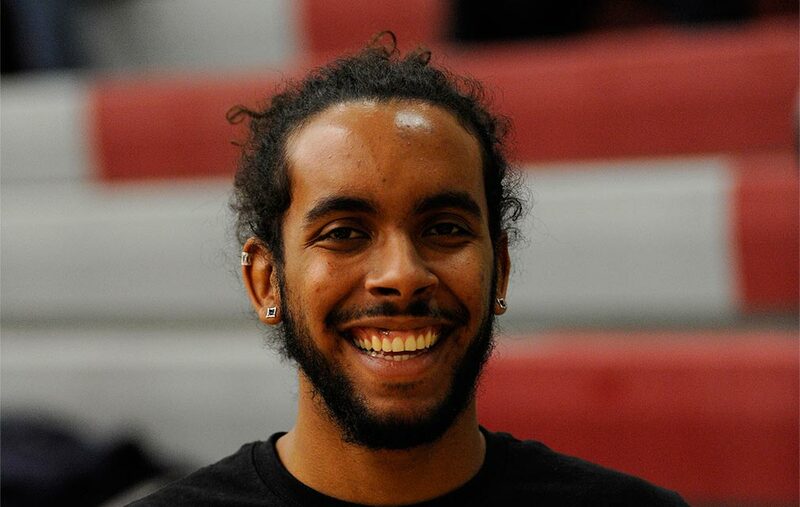 Fans at Cotterell Court also witnessed another impressive accomplishment at the February 28 game: Damon Sherman-Newsome ’15 reached 1,000 career points, Colgate’s 30th men’s basketball player to hit that mark. He finished the game with 11 points, as did Matt McMullen ’15 and Ethan Jacobs ’15. The three, along with classmates Luke Roh, Pat Moore, Nic Lane, and Anthony DeRiggs, were all honored prior to the start of the contest because it was the seniors’ last regular season game on home court. The following Monday, the Patriot League honored Roh, Sherman-Newsome, and Jacobs with conference accolades. Roh was named the Patriot League Defensive Player of the Year, while Sherman-Newsome earned all-first team honors and Jacobs scored all-second team praise. The versatile Roh averaged 9.7 points, 6 rebounds, and 2.7 assists per game for the season; and 11.0 points, 5.8 rebounds, and 2.8 assists during Patriot League action. He became Colgate’s first Patriot League Defensive Player of the Year honoree, and the first major award recipient for the university since Mark Linebaugh ’04 was named Rookie of the Year in 2001. Sherman-Newsome led the Raiders with 15.4 points per game in league action and 14.8 for the season. At press time, the sociology and anthropology major from Anchorage, Alaska, had posted 49 double-digit–scoring games. He was also leading the team with 66 makes from behind the arc and 166 field goals this season. Helping out on the glass, Sherman-Newsome pulled down more than 100 rebounds during the season. Jacobs was Colgate’s second player on the top two teams — he averaged 13.8 points per game in league play and 12.6 for the season. 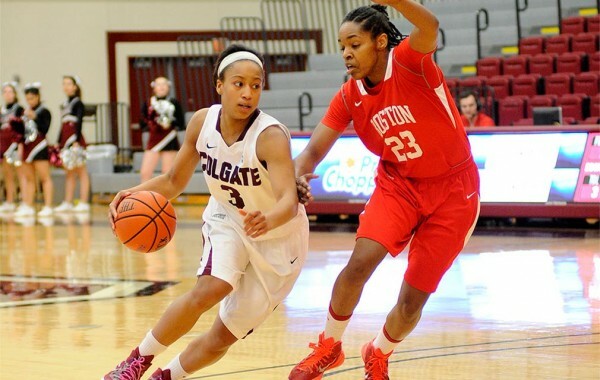 The psychology major made a tremendous impact in Colgate’s scoring. At press time, he had five 20-plus games, including a career-high 26 points against Columbia this year and a career-best 10 rebounds against Lafayette in 2014. In his two years, he notched 748 points, 274 rebounds, 59 blocks, and 43 double-digit–scoring contests. Jacobs also hit 39 shots from behind the arc. He was third on the team in rebounding. Men’s basketball had a lot to celebrate the first weekend in February. The Raiders were not only victorious over American, 59-43, but they also honored two magical teams in program history. The Colgate family welcomed back the 1995 and 1996 Patriot League championship teams on the 20th anniversary of the first title-winning season. It was a remarkable run, with the Raiders capturing league titles and making back-to-back appearances in the Big Dance. In those two seasons, the Raiders both compiled a 20-6 Patriot League record and advanced to the NCAA tournament for the first time. 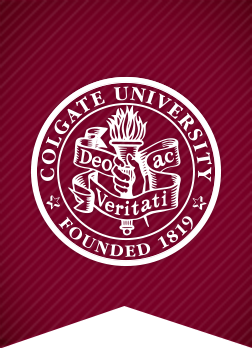 Colgate acknowledged many members of those teams, including notables like Adonal Foyle ’98 and Tucker Neale ’95, during halftime of the February 7 game. 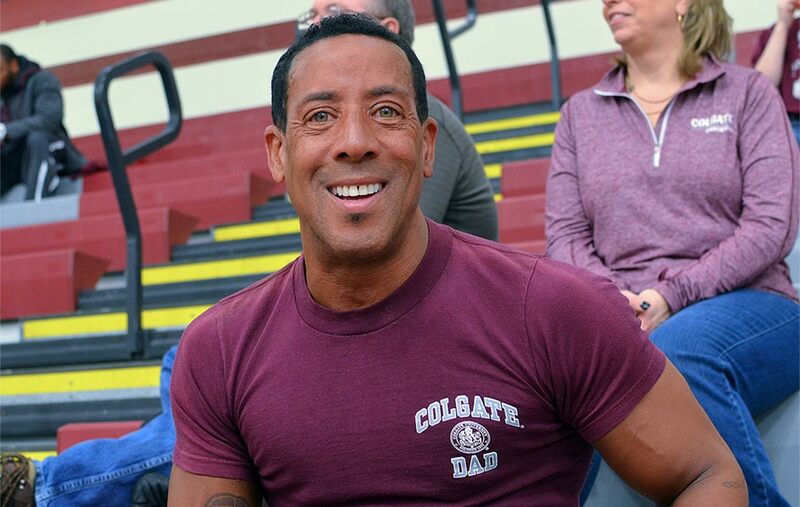 Foyle starred for 13 seasons in the NBA, and Neale remains Colgate’s all-time leading scorer. Two more special guests at the ceremony were the wife and son of the late head coach Jack Bruen, who guided the Raiders to those two championship banners (he died in 1997). Prior to the featured event that day, many of the former players laced up their shoes and threw on Colgate gear to participate in an alumni game. Later, family and friends gathered to honor the two teams at a banquet, which featured a highlight video from those years. Among those who spoke at the banquet were Colgate Director of Athletics Victoria M. Chun ’91, MA’94, along with Brendan Tuohey ’96 and Nate O’Neil ’94. 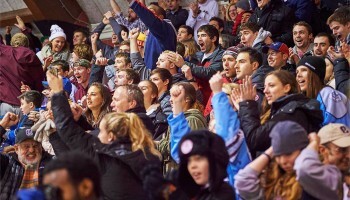 Attracting more than 4,200 fans, the contest took place at Cornell’s Lynah Rink during the second leg of the team’s annual home-and-home series. Each team was assigned three “honorary coaches,” who were all participants in Camp Good Days’ programs and services. 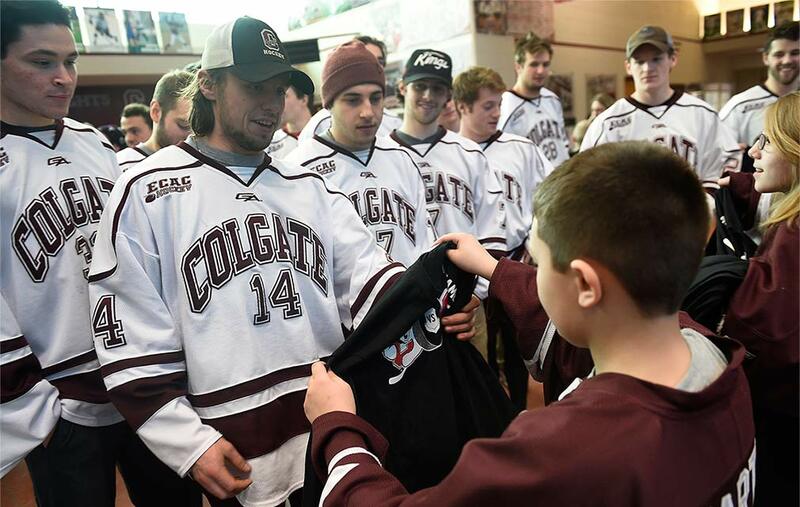 In advance of the game, the three children met the team at Colgate, where they received jerseys, watched practice, and ate pizza with the players. On game night, they joined their teams in a VIP area before warmups and were at center ice for a ceremonial puck drop. The men’s and women’s swimming and diving teams received recognition from the College Swimming Coaches Association of America (CSCAA) for their hard work in the classroom this season. Both squads, led by head coach Andrew Waeger, garnered a spot on the 2014 Fall CSCAA Scholar All-America Teams. The all-America program recognizes teams that have achieved a combined grade point average of 3.0 or higher during the fall semester. The men’s team earned a cumulative GPA of 3.17 for the fall term, while the women had a 3.11 GPA. Colgate is one of three Patriot League teams to have both squads recognized by the CSCAA (the others are Lafayette and American). The CSCAA Scholar All-America Program, which is supported by Nike Swim, presents the award both in the fall and winter/spring. For their good work in the pool, Morgan Cohara ’16 and Lindsey Sagasta ’16 were named All-Patriot League Second-Team. 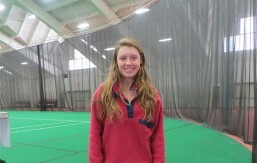 Cohara garnered all-league honors for the third time in her career; she was a first-team honoree as a sophomore and a second-team selection during her first year. The Sagamore Hills, Ohio, native posted a pair of fourth-place finishes in the 200 backstroke (2:00.21) and 500 freestyle (4:54.33) and took 15th in the 200 freestyle (1:52.18) during the championships at the end of February. Sagasta, meanwhile, earned all-conference accolades for the first time in her career after advancing to the final heats in three freestyle championship events. Hailing from Tonawanda, N.Y., she placed third in the 200 freestyle (1:49.45) and also turned in top 16 finishes in the 100 (51.18/6th) and 50 (23.89/14th) freestyle sprints. Both Cohara and Sagasta played a key role in the team’s success in relay competition, swimming in the 200, 400, and 800 freestyle events. The duo swam the final two legs of the 400 freestyle relay that took third place with a time of 3:24.90. 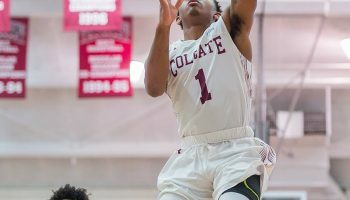 Randyll Butler ’16 (#3) made seven of nine shots from the field and led all scorers with 18 points when Colgate bounced past Boston University 67-54 on February 11 in Cotterell Court. The Raiders concluded their season at 9-22 after losing to second-seeded Army in the Patriot League Quarterfinals (48-45). The Raiders won their last three Patriot League games to finish with their most conference wins (7-11) since the 2003–04 championship team. 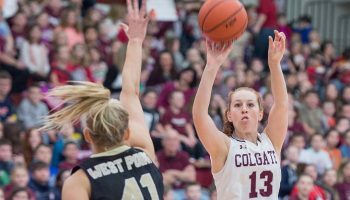 Colgate won four straight games for the first time since the start of the 2009–10 season, and also set a program record for free-throw accuracy. What brings you to the game today? My daughter, Randyll [#3, guard, pictured above], is a junior, and we don’t get the chance to come to too many of her games. We’re here to cheer them on. Colgate’s currently trailing BU 29-28. What do you think’s going to happen? This game is awesome. I think they’re going to overcome BU. The cheering and the enthusiasm from the crowd is really going to help us win tonight! What’s your favorite part about watching this sport? 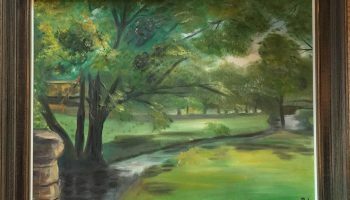 The plays, and the strategy of the team — how they talk effectively to overcome their opponents. Their communication has improved a lot over the past few seasons. I’m looking forward to next season — we’re really going to kill it! Why are you at the game today? I’m at this game because I’m queer, and I’m a Colgate student. I like to be present on campus, and also, it’s a great event. I’m here to show support. People are getting into it… And, we’re winning, so it’s a good day. Do you have any suggestions for LGBTQ students at Colgate? There’s LGBTQ Initiatives, and Advocates, but not a lot of people seem to know about Lambda, which is a group specifically for queer and questioning students. We meet once a week and it’s a really good time. It’s easy to reach out. What brings you to the match today? My friend, Kelly, is a freshman on the team. I wanted to come watch her because this is the first home match. What other Raider sports do you follow? I write for the Maroon-News, so I followed the field hockey team first semester and now I follow women’s basketball. I go to the hockey games the most. What do you like best about Colgate sports? There’s definitely a sense of camaraderie with the fans. Even if there’s not a huge cheering section, people are there because they’re interested and because they want to see the team do well.